Fun Family Friday Night is very late this time of year with my husband not getting home until what is usually after the boys’ bed time. I try not to whine about his schedule and how we miss him. Mostly, I just feel bad for him. Working for a tax software company means that we don’t see him much until after April and he doesn’t get a break. Working on his own business in addition to holding a full time job with overtime means he never gets a day off. It puts food on the table, however, when so many Americans are without jobs and struggling just to keep their homes and feed their children. So…late, without him, whatever…Fun Family Friday Night goes on so we can feel a bit of normalcy even when he’s gone. He doesn’t mind when I keep something warm for him on the stove or in the oven, but when I think the taste or texture will be diminished by holding a meal for him, we just wait and have it together. That’s how the wings last Friday went. The boys and I made a snack of Ham, Brie, and Strawberry Baguette very early in the evening, saving their dad’s portion for him, which kept surprisingly well, then I made these hot wings closer to the time that he was expected home. It was fun; more of a midnight snack with a double dose of Dr. Who. I’m not a big wings person. I prefer a chicken breast with spicy sauce and blue cheese crumbles on a bun, which happens to be Hubby’s favorite sandwich, but when you think that those silly wings are fifty cents a pop at some restaurants, you sure appreciate a pan full of them made in your own kitchen. Baking them, rather than breading and frying, cut down a lot on the fat and calories even though we still had them with the traditional dressing. I just tucked the wing tips under to keep them from scorching and roasted them at 350 for about 30 minutes. I basted them with Texas Pete several times on both sides, letting it bake on for another 10 or 15 minutes, and took the bottle to the table with them in case anyone wanted their wings even spicier. For the dressing, I just mix mayo with blue cheese and add salt and pepper to taste. I probably used 1 cup mayo/5oz. cheese on this occasion. 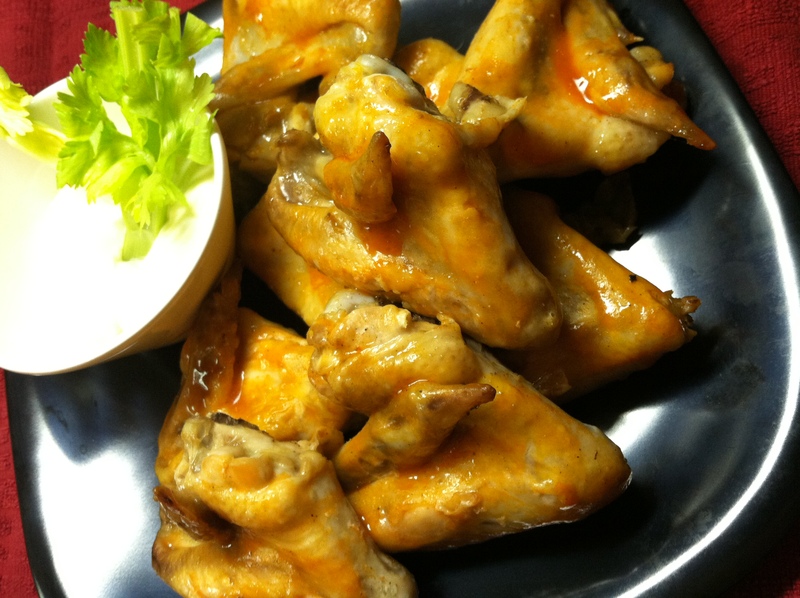 Celery sticks are a must have garnish with hot wings and great for munching dipped in the dressing. For you Crock Pot fans, I’ll bet these would work pretty well in the slow cooker with hot sauce in a bit of water until they almost fall apart. I may try that next time. Maybe for Super Bowl Sunday?